Since ancient times, we Indians have been embracing the power of Ayurveda in our everyday skincare practice. And when the same goodness of Ayurveda is available in a commercial packaging, how can we say ‘no’ to it? The reputed brand ‘Biotique’ has been offering exactly the same through its highly popular skincare range. Being an oily-skinned girl with a tendency of breaking out every now and then, I could not help but try its Morning Nectar Lotion. 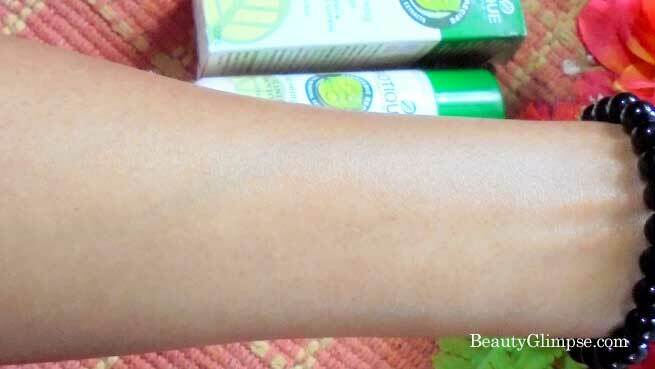 So, today, I am reviewing Biotique Bio Morning Nectar Flawless Skin Lotion. Read on to know if it is worth trying or not. The Biotique Bio Morning Nectar Flawless Skin Lotion is an ultra-soothing face lotion that moisturizes the skin beautifully, keeps it blemish-free, and makes it visibly flawless over time. It is a complete Ayurvedic recipe that blends nectar, pure honey, wheat germ, and seaweed for a noticeably fresher and fairer complexion. It also comes with SPF 30+ (UVA/UVB protection) to keep the skin protected from sun damages. You can see a lighter, line-less, and replenished skin by using it regularly. N.B. : This is not a cosmetic product. It has therapeutic properties. Ingredients used in Biotique products are 100% pure, organic, preservative-free, and renewable resources. They are cultivated, collected, blended, and produced in the foothills of the Himalayas. Active ingredients: Nectar, pure honey, wheat germ, and seaweed. Full List Of Ingredients: Baheda (Terminalia Belerica) 2.0%, Methi (Trigonella Foenum Graecum) 1.0%, Ankurit Gehun (Triticum Vulgare) 3.0%, Madhu (Honey Mel.) 1.5%, Kusumbhi (Carthamus Tinctorious) 3.0%, Vach (Acorus Calamus) 0.5%, Lotion base Q.S. Honey is the nectar of life, composed of healing, brightening sugars, and minerals known to purify, heal, and soothe the skin. It also contains vitamins B1, B2, C, B6, B5, and B3, as well as traces of copper, iodine, and zinc. Wheat Germ is one of the most sensitive oils in the botanical world. The natural antioxidant contains lecithin, vitamins A and D, and more vitamin E than any other natural oil. Its pampering properties also protect skin from dryness and environmental stress. Seaweed belongs to a large group of plant life called algae and is drenched with lipids, proteins, vitamins, minerals, and other nutritive and detoxifying elements necessary to sustain a healthy life. The product comes in a standard Biotique packaging. The 120 ml bottle is quite travel-friendly as it is a simple plastic-made semi-opaque bottle with a tight green screw lid. However, the bottle opens directly and there is no pump dispenser, which can cause the product spill out. Hence, I am not much impressed with it. The lotion describes itself as ‘Morning Nectar’ and claims to contain the real ‘nectar’ for utmost skin care. Nectar is the sweet fluid that is produced by flowering plants every day, which has been used on the skin to sustain ageless beauty from time immemorial. 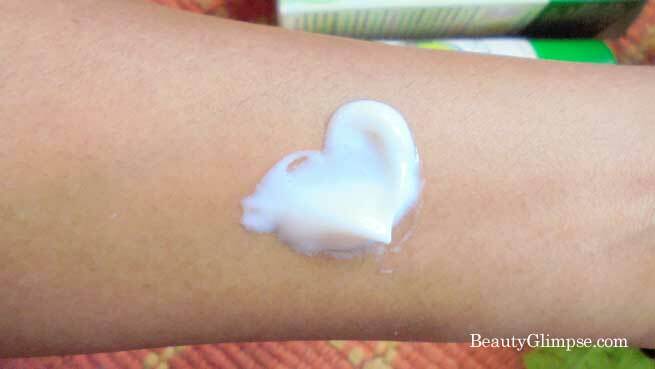 This nectar is used in this nourishing and lightening lotion along with pure honey, wheat germ, and seaweed. It apparently sinks into the skin and replaces the natural oils as well as replenishes the lost moisture. It also softens and brightens the skin for a noticeably fair and fresh complexion. I have been using this lotion for around 2 weeks now. First of all, I was expecting a thin consistency of the product as it was mentioned on the packaging, but I was surprised to find it somewhat thick. It is white in color and creamy in consistency. The fragrance is pleasant and not the type that can give you a headache. I have an oily skin, but the lotion really did not give me any breakout. As the packaging says that it can be used both in the morning and at night, I did exactly the same. It is not very lightweight and hence, does not get absorbed into the skin instantly. It feels a little greasy but the presence of nectar makes it free from the typical greasiness. I love this nourishing lotion and use it after my regular cleansing, toning, and serum regimen. I am already a fan of their Bio Dandelion Serum and in combination with this moisturizing lotion, my skin is in its best condition. I recommend this to all skin types except for the sensitive skin. It does a fair job on the moisturizing part but the lightening is something that I don’t agree with. I do not know why they market it claiming as a lightening product when it clearly does not do that. 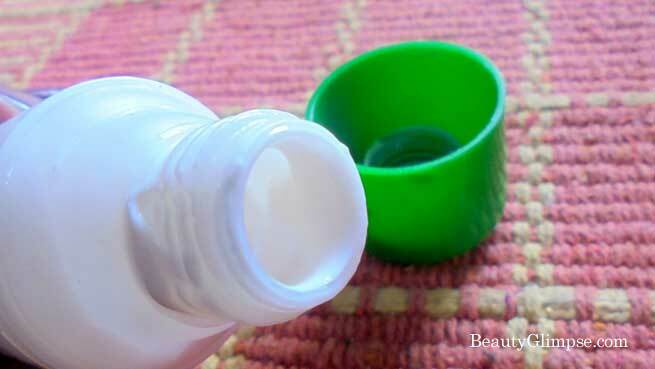 Apply the lotion evenly to your thoroughly cleansed face and neck in the morning or evening. You can wear it alone or use it as a base before applying the makeup. Yes, I will. I hardly get any moisturizer that does not break me out during summers and this one has been great on my oily skin. 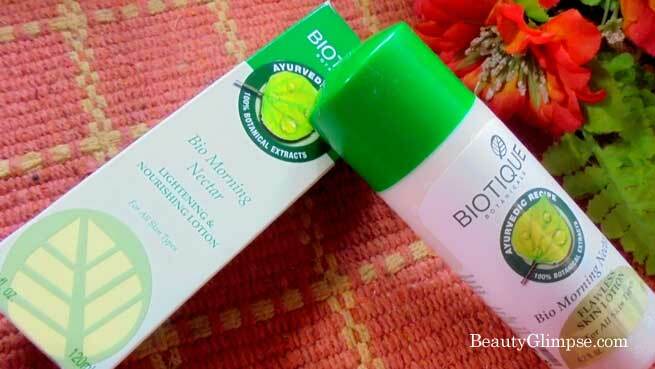 The Biotique Bio Morning Nectar Flawless Skin Lotion is a good moisturizing lotion and is definitely a must buy if you are looking for an all-natural moisturizer.